Obelix! From the Asterix and Obelix comics and movies. Obelix is a mehir sculptor and deliveryman. This one is different too: it's pasted up, behind these window bars, with a special glue concoction. Obelix has permanent superhuman strength which allows him to be such an efficient delivery man as menhirs are solid rock and super heavy. 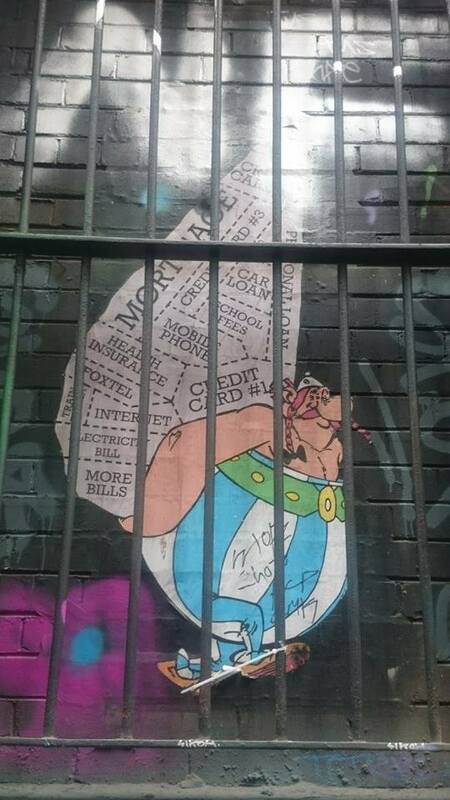 Take this as you will, personally I see "give all of your bills and payments to Obelix to carry around and don't worry about it". Or maybe it is more rounded and suggests that the weight that our bills and payments have on us is heavy... and that we act like they're not? “3,” Street Art deTours, accessed April 20, 2019, http://streetartdetours.com/document/1025.